WAWA, Pa. – In August 2011, Wawa Inc. began preparing for a leadership change. Former CEO Howard Stoeckel announced he would be retiring from his role and the Wawa, Pa.-based company tapped then-Chief Financial Officer Chris Gheysens to take the helm. The official changing of the guard occurred Jan. 1 of this year, but the groundwork was months in the making -- 16 months to be exact. "To be honest, when I was first given the news [of the change] in August 2011 and [told] it was going to be Jan. 1, 2013, my first reaction internally was 'Wow, that's a long time.' But it was exactly the right time, the right process," Gheysens said. Now four months into his new role as president and CEO, Gheysens sat down this morning with CSNews Online before the grand opening of Wawa’s Elizabeth, N.J., store. The new northern New Jersey location marks the company's 617th store overall and its second most-northern site after the Wawa in Kearny, N.J., which opened in January. While Gheysens took the baton during a busy time for the company, he did not come unprepared. Specifically, he began his tenure as CEO armed with a six-point plan for year one. Achieve the financial goals the company has set through its budgeting process. Open 48 new stores, more than in any other year. Approximately half of those will be in Florida. Enhance its offer in terms of the “fast casual to go” market. One key element is rolling out in-store baking for Wawa's famous hoagie offer -- a whole new oven platform that the retailer can build upon and innovate from in the future. Optimize its Florida investment. Wawa has 16 stores open today and will have 31 open in the Sunshine State by the end of the year. "We will begin to transition the mindset from start-up to mainstream," he noted. Look at mobile applications, loyalty-type programs and engaging customers with store-level "Voice of the Customer" surveys. Focus on enterprise productivity. "We are focused on growth, but at the same time, we have to be focused on being more efficient; being more productive so we can reinvest those dollars back into the business," Gheysens explained. "At the end of my first year in this role, I want the organization to achieve our financial goals, which we have set with our budgeting process. But more importantly, I want to look at our culture and our people and make sure, even with the transition of leadership, what remains steadfast is our focus on our cultures and our values," he added. While the six-point plan is for 2013, it falls under Wawa's multi-year strategic plan. For example, with 48 new stores slated this year, the company hopes to continue that pace going forward. Moving ahead with its mobility and loyalty initiatives will also fold into next year. "I am a big fan of mobile apps and quite frankly, we are behind the times with that. That's an area where we are pushing forward, to really build our brand outside our four walls," Gheysens said. At the same time, he acknowledged that this will take some time. "The initiatives around mobility and loyalty will be a multi-year journey. We want to put a stake in the ground this year in defining those initiatives and getting leeway, and we are probably looking at next year to implement them." Chris Gheysens (center), President and CEO of Wawa Inc.
Gheysens admitted that one challenge he faces is that he likes to do a lot, to do it all now and to do it right. In that respect, he has something in common with Wawa. The company, he said, "has a lot of great ideas and tremendous opportunities for growth and other ways to improve the experience." However, at the basis of it all are pride in ownership, shared ownership and servant leadership. "These are the three foundational items to our core values that have been with every leader in some way, in some form for decades," he said. "The worst thing I can do is achieve the six-point plan and nail it, and let the culture pass me by or fade. That won't happen." 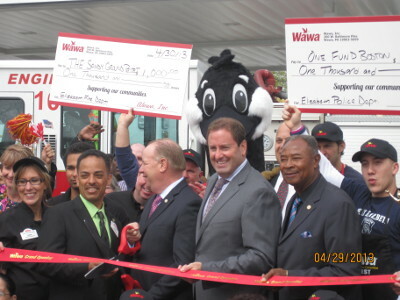 Wawa is unique in the convenience store industry because it offers an employee shared ownership program. Forty percent of the company is owned by its associates, giving them "a line of sight" to their financial success, according to Gheysens. "When they make a hoagie, serve a customer or greet a customer, that is going to improve their financial future personally. And when you are also one big family, that is a competitive advantage and that is tremendous," he said. Wawa’s future depends on new stores in expanded markets, but it also relies on existing stores. The company sees its Florida locations as its new store design and is working on what Gheysens calls "Florida 2.0," or bringing elements of the new design to the next level. The plan is to bring the latest and greatest of the elements to all existing Wawa stores through an aggressive remodel program in the near future. "We've been investing in a horizontal, programmatic way. Now, we need to go and touch -- on a store-by-store way -- the exterior and the interior with more of the functional pieces so when a customer walks in, they know it's different and it's new," the chief executive said. "That's going to be a big undertaking. But frankly, Florida or north Jersey doesn't work if our core market stores don't work. Something we will never do is take our eye off our core markets." The company also realizes it needs to turn a special focus to its legacy stores -- those locations without fuel. Speaking of legacy, Gheysens believes it’s too early to say what he wants his legacy to be at Wawa. Even though his business cards read "Lead Goose," he stressed that the strategic planning process at the company is the result of teamwork. With all this on his plate, Gheysens has taken the first four months of his own new journey to settle in, assess the future talent of Wawa's associates and build on the communication within the company. The biggest adjustment for him has been realizing now he’s “the guy” in charge. “You just can't understand that until you are in that seat, it's official and you look at your business card and it says president and CEO -- actually Lead Goose," he said. “It’s a self-imposed pressure, as much as the pressure is there, and that's because of the responsibility I have to the shareholders, to our associates and to our culture. That's an enormous responsibility. It's all a good thing – that self-imposed pressure. It makes me operate at a better, higher level."